When it comes to finding the right guy, women want a man who can perform these basic tasks. No, it’s not what you’re thinking. Yes, she wants you to be a good lover but she also needs you to be her protector and partner outside of the bedroom as well. Master these skills and you’ll not only turn her head, but friends and business associates as well. In the 21st century, a lot of men around or under the age of thirty just haven’t learned how to change a tire. It’s not your fault. After all, you don’t have the same kind of time on your hands your grandfather did and they invented AAA for a reason, right? Still, your cell phone won’t always work on a deserted road in the middle of the night when it’s 30 degrees outside and your girlfriend is wearing her favorite strapless dress. Ergo, changing a tire is on the list of things every man should know how to do. First, be sure the vehicle is pulled as safely off the road as possible. 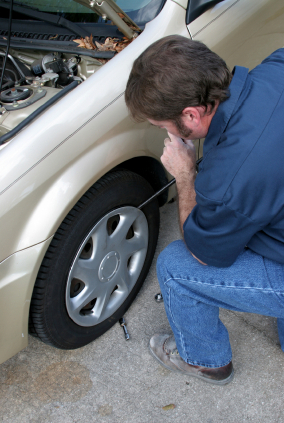 The tools you’ll need are: Spare tire, tire jack, lug wrench, tire blocks, gloves, and flashlight. Step 4: Jack up the vehicle. Consult your owner’s manual to find out where the jack should be positioned. Position the jack under the car and raise it. Step 7: Grab the spare tire and position it directly in front of the wheel well. Align the holes in the spare tire with the bolts on the vehicle. Lift the spare tire into position and push it into the vehicle until it can go no further. Now all you have to do is put your tools away and drive on your way! Another one of the things every man should know is how to get a bartender’s attention without resorting to a lot of corny hand gestures and hollering. Stand as close to the serving station as possible and keep your money visible. Maintain eye contact but resist the urge to flash or wave the money around. The bartender sees you; he just has to finish mixing a few drinks first before he takes your order. Have your partner lie down on the bed or other comfortable flat surface. Squeeze a nickel-sized drop of massage oil onto your hands and lay them gently on her skin. Beginning at the upper back, gently knead the muscles, working your way up to her neck and down her arms to the fingertips. Work back up her arms until you reach her upper back once more. Then, with the heels of your hands, knead the muscles on either side of her spine in circular muscles while working downward toward her buttocks. Finish by using your palms to gently work the entire buttocks area. The entire process should take no less than 30 minutes. If she doesn’t fall asleep, she’ll likely reward your good efforts! If you don’t know how to catch a fish, now is the time to learn. First, if you’ve never fished before, just keep it simple. Get a graphite or fiberglass pole and some monofilament fishing line. For freshwater fish, you’ll need a 6-8 pound fishing line. For saltwater, grab the 10-12 pound kind. Next, you’ll need bait. You can use cheese or kettle corn to catch trout, and shrimp to catch just about any saltwater fish. Can you use worms? Sure. They’ll catch just about anything in fresh water! Now, you’ll need to add the fishing line to the pole. To do this, thread the new line through the eyes of the pole and tie the line to reel. Next, you’ll wind the line onto the reel by cranking it about 20 times. Make sure your line isn’t twisted. If it is, turn the spool over. Fill the reel to 1/8th of an inch from the spool rim. Next, you’re going to add a hook. The kind of hook you’ll choose will depend on your bait. For example, you’ll need a size 3/0 for worms and a 1/0 for shrimp. Tie a Palomar knot so the hook won’t slip. Your next step will be to attach the bobber six to eight inches from the tip of the rod and attach the sinker to the end of the line. Once you find your desired fishing spot, grab the rod, press the release button, twist your body and cast the bobber into the water. It takes practice but you’ll get it. Here’s a visual demonstration on how to cast a fishing rod. Once you’ve done this, all you have to do is catch the right fish. Bring a bucket or cooler with you to take home your catch. To build a fire, you need tinder, kindling, dry wood, and a way to start the fire. Gather small sticks, dried grass, dry needles, lint, wood shavings, and dry wood. One of the best and easiest ways to build a fire is to use the teepee method. With this method, you place tinder and kindling at the bottom and “teepee” larger logs around the kindling. This way, when you light the kindling, the logs will fall inward and give your fire a slow, even burn. When burning a fire, always make sure you have it contained. This means digging a bit or containing the flames with large rocks. Use a large stick to stir the embers and keep the going. Swirl the embers around to make the fire die down. First, rinse the fish in ocean or purified water, then cut off the head just behind the gills. Next, de-scale it using the dull edge of the fillet knife. Scrape against the grain until the surface is smooth. Afterwards, place the fish on a clean, sturdy surface and insert the tip of your knife near the top of the dorsal fin. Hold the blade edge against the backbone and slit along the skin until you reach the tail. Flip the fish over and repeat the same procedure on the other side. Next, you’ll slide your blade partway up the ribcage at a slightly upward angle and cut while pulling the fillet away from the rest of the fish. You’re almost done. Next, you’re going to position your knife parallel to the top of the cutting surface, slice into the bottom of the fillet, and use downward pressure to separate the meat from the skin. Repeat on the other side. The trick is to remove as much of the red meat as possible without destroying the white meat. Now all you’ll need to cook it is a fire grate and some seasonings! Don’t worry it’s going to ruin your image to learn how to sew a button. It’s an essential skill that every man should know. First, take about twenty inches of thread and knot it securely at one end. Thread the other end through your needle. Make a single stitch in the shirt or coat in line with the row of buttons. Hold the button about 1/8th of an inch from the garment and thread the needle through one hole then diagonally down into the next hole. Repeat the same procedure with the opposite holes and do this four times. Wrap the rest of the thread around the 1/8th inch shank you created to create a pillar. Push the needle through this pillar, secure, and cut the thread. All done! It may disappoint you to learn that real-world bar-fight punches do not land squarely and evenly the way they do in movies. That said, it doesn’t mean you can’t learn how to throw a good punch when you need to defend yourself. First, pick a target. No, don’t just pick some random guy for target practice. Pick a part of his face you want to hit. The nose is usually the most sensitive, followed by the jaw-line. Next, comes the stance. If you’re right-handed, you want to put your left foot forward and your right foot back. If you’re a leftie, you’ll do the exact opposite. Bend slightly with your knees to lower your center of gravity. Either way, your back leg should support most of your weight. There’s a big difference in impact when you’re punching with your body versus punching with your arm. When you’re ready to throw the punch, push off slightly with your back foot, extend your arm and punch, swiveling with your torso. If you’re lucky, you’ll hit the guy the first time. Try to recover quickly because your fist is going to hurt and he’s probably going to hit you back if you didn’t know him out. Get back into your original stance and get ready to fight again if you have to. Once you’re no longer in danger, walk away. Alright, trying to explain every way you can tie a tie will be a post in and of itself so check out this link to learn how to tie a tie. Plus, visuals are a lot easier for most of us (especially when we’re in a hurry)! 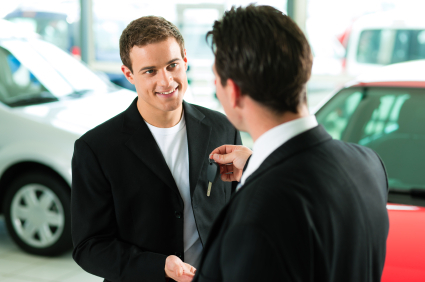 Negotiating down the price of a car is one of those things every man should know. First and foremost, confidence is the key to winning any negotiation. Also, a sense of humor doesn’t hurt. Remember, don’t act nervous, desperate or worried. Some car salesmen are like sharks; if they smell blood, they’ll go in for the kill. When you’re ready to make an offer, stay in control. Let him know you’re in no hurry to purchase a car today but that if the manager accepts your offer, you’ll be more than glad to sign the necessary papers and drive away today! There’s a reason women are attracted to men like James Bond. Women want a man who can take charge of a situation and protect them when necessary. Once you learn the few skills every man should know, you’ll not only impress her but yourself as well and that goes a long way in improving your confidence!